A gauge used for checking and testing the 29° angle and the width at the end of a thread cutting tool while grinding it.And it is also used for setting the tool square with the axis of the work piece. Some work has to be set at a particular angle to the surface of the table, and this is often effected by bolting it to an adjustable angle plate. A type of total radiation pyrometer. BORING BAR MICROMETER – On boring operations, it is often necessary to adjust the cutter setting by a few thousandths of an inch.With this, it is possible to determine exactly the depth of cut taken. Instrument used for measuring distances between or over surfaces, or for comparing dimensions of workpiece with such standards as plug gauges, graduated rules etc. Center Square is intended for marking the centers of round or square stock. Instrument used for measuring angles relative to the horizontal plane. DEPTH GAUGE:– Gauge used for the purpose of measuring the distance between two surfaces, to find or check the depth of a counter bored hole, a recess etc. Instrument indicating the movement of a projecting plunger by the movement of a hand or pointer over a graduated dial. Gauge fitted with a dial or clock for measuring or comparing the thickness of sheet metal plates. These are essentially scribers for marking arcs, and circles,hence their points are hard and sharp. They are used for dividing distances into a number of equal parts. Also used for transferring dimensions from a rule to the work. Tool for measuring the size of drills.DRILL GRINDING GAUGE – A tool for checking the angle and length of the cutting lips on a twist drill while grinding it. Also it may be called a drill point gauge or a drill angle gauge. Engineer Tapers are intended for measuring hole sizes, slot widths, caliper settings and so on. Consist of a number of thin metal blades, each of a different thickness and in the desired number of dimensional steps. They are used for checking clearances. Instrument for measuring the hardness of materials, particularly metals. A tool or instrument for checking or measuring the sizes of metal parts to determine whether the dimensions are within the specified limits. accurate measurement in tool, gauge, and die manufacture. Marking out or measuring tool designed on the lines of a scribing block, but capable of more accurate duty. A caliper having one leg similar to that of an inside caliper, while the other leg is pointed like a divider leg. A steel rule with a projecting piece or hook at one end at right angles to the edge of the rule. Inside Vernier Caliper is intended mainly for checking internal dimensions, such as the diameter of bores, and so on. Vernier protractor is used for measuring angles accurately. These refer to Johansson precision gauge blocks. Knife Edge Vernier Caliper has jaws which are reduced to a very narrow edge. These are useful for measuring in restricted places or on curved surfaces. U tube device employed during the levelling and setting of work too long for the use of a spirit level. A gauge that represents a limiting (maximum and minimum) size within which the work will be acceptable. 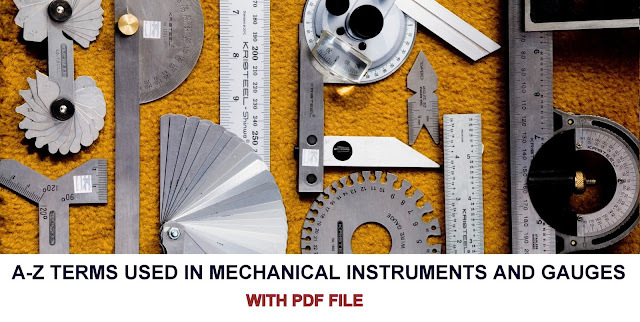 A precision, screw adjusted measuring instrument with which dimensions can be read in thousandths and ten thousandths of an inch. A dial on the screw of a machine to indicate the extent of the movement of the screw or parts attached to the screw and usually graduated to read thousandths of an inch. The ordinary depth gauge has been elaborated by the addition of a micrometer head. Delicate form of indicator showing the movement of a projecting plunger usually placed at one end. Caliper having one leg bent inwards at its ends, like the two legs on a pair of inside calipers, the other leg being pointed or having a separate hardened point attached to it. Plate generally made of glass or quartz and used as a standard of reference as a flat surface. Angle measuring instrument fitted with a scale read by an optical magnifying device. Steel or cast iron block used when setting up work for machining, marking out or measuring. End measuring pins for determining bore diameters. A gauge on which the outside measuring surfaces are designed to test the specified dimensions of holes. May be straight or tapered, plain or threaded, and of any cross-sectional shape. Weight hung on the end of a cord so that when the latter is supported at its top end the cord will hang vertical. An instrument designed to measure, among other things, the errors in the size, shape and alignment of bores,with compressed air. Instrument graduated so as to enable the measurement of angles to be made in degrees. Specified type of thermometer used to measure high temperatures in the production and heat treatment of metals and alloys. Tool used for checking the radius of small fillets or rounded corners. Instruments which provide a permanent record of readings such as steam pressure, steam flow, air flow, flue gas temperature, feed water temperature, fuel flow and fuel temperature. A gauge in which the inside measuring surfaces are circular in form. A ring gauge may be cylindrical or conical, plain or threaded. Type of gauge for checking the accuracy of a screw thread. A small tool with a number of blades, each having the same number of notches per inch as the thread it represents. It is used to find the pitch and number of threads per inch on a screw, tap or die. Type of micrometer with measuring points specially shaped to enable the measurement of pitch diameter and thickness of thread. Used for making lines on the work when marking off. Tool used for the accurate setting out of angles by arranging to convert angular measurements to linear ones. Form of gauge made of hardened steel with two parallel faces worked to high precision and at a known distance apart. A type of fixed gauge, plain or adjustable, arranged with inside measuring surfaces for checking diameters, lengths, thicknesses or widths of workpieces. Inside or outside calipers for measuring workpieces in which the tension against the nut is maintained by a circular spring at the end. A thin flat measuring tool graduated in either fractional or decimal part of an inch or cm and made in many styles and lengths. Strip of metal, usually steel, with one edge straight, used to determine the flatness of a surface. A solid internal gauge in the form of a frustrum of a cone having diameter, taper and length suitable for measuring the dimensions of an internal taper of specified size. A flat pattern or guide plate usually made from sheet metal and used as a gauge or guide when laying out, drilling, forming in a machine or filing irregular shapes on metal workpieces. hole that is to be measured. Tool for checking the form and pitch of screw threads. Instrument used in accurate inspection of thread forms, form tools and complex contours. Torsion measuring device fitted to a rotating shaft or component to measure the torque developed at any given moment under actual running conditions. Instrument used to measure and record the amplitude and frequency of torsional vibrations in a rotating shaft or other part. Trammels are generally used for laying off and checking dimensions of several feet, they are generally used in conjunction with a large steel rule, which may be from 3 to 10 ft long. A caliper designed to take measurement in recesses or over a projection. One leg can be separated or opened to remove the caliper and then returned to the measured size. Instrument used for setting and checking a line, an edge or a face which is required to be at right angles to some other plane which should be regarded as a datum or reference plane. Gauge used to measure the amount of vacuum in any vessel in which a pressure lower than atmospheric pressure is produced by evacuation of air, vapour and gas. scale of the instrument to which the vernier is attached. Precision measuring instrument consisting of a beam or rule having a fixed jaw at one end, and a straight jaw to which is attached a vernier scale. A gauge that shows the proper water level which must be maintained in a boiler to avoid overheating damage. Sizes of standard wire and sheet metal are normally expressed not by a dimension in cm, but by a number or gauge size. Type of plug, and caliper gauge introduced by Joseph Whitworth.